My husband and I took a quick trip to the outer banks over the weekend. It was absolutely awesome! 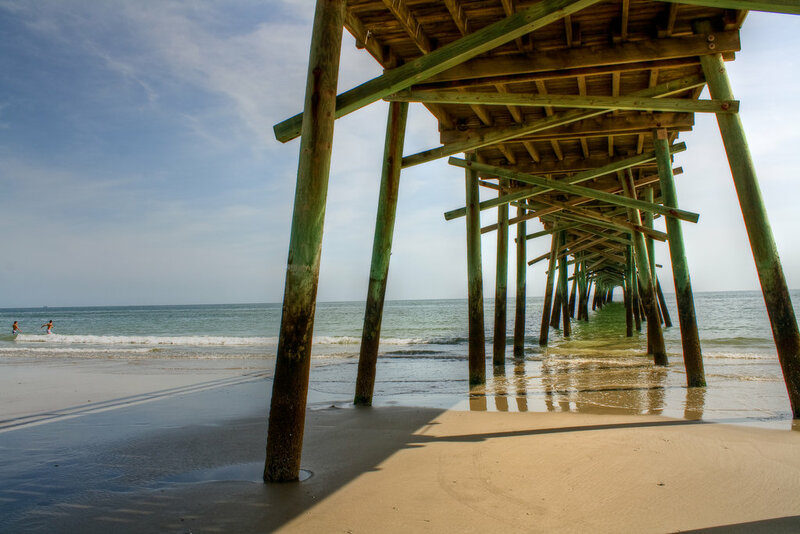 The picture to the left is one my husband took of the pier near our “direct access” to the beach. Our motel was really quirky, but it was really family friendly; we only had to walk a couple blocks to get to the lightly populated beach. On Saturday, we left around 5 to hit the road. As we started to get closer to the beach, we got discouraged because a haze lifted from the ground. We then drove right into a very thick fog. My husband being a photographer, my heart sank as it seemed the fog would not lift and all hopes of him getting any exciting pictures dwindled. As we drove into Morehead City, it lifted, thankfully. We hit Fort Macon first. The pictures of the fort he got are so neat! We walked on the beach there and saw tug boats and large ships up close. Then after checking into our hotel and getting a light sunburn while waiting for the sunset on the beach most of the afternoon, we got dressed up for dinner. Amos Mosquitos was so great! Not too far from our motel, it was decorated like a mossy swamp. Loved it! We had to wait about an hour, but it was so worth it. The food was amazing and come to find out, quite reasonably priced for what we chose. We had crab legs, flounder, shrimp, and fries…and couldn’t finish it all. By the time we were finished, we were having a hard time keeping our eyes opened. Sunday morning we rested. We had planned to get up at 5 and watch the sunrise, but we were so exhausted. I woke up at 7:30 and that icky fog covered the ground…we didn’t miss much in that way. After checking out of our motel, we headed for Beaufort. Such a neat town! We ate brunch at a cafe on the docks, then walked around. Everyone was so kind! I had forgotten to bring sunscreen, so a girl at a shop gave me some for free. Then James and I got on a ferry boat and headed towards Shackleford Island. It is an uninhabited island with about 120 horses and no shade….how beautiful it was!!! We only stayed a couple of hours, but I think we could have stayed all day. The weather was perfect, the ocean side of the island had enormous shells and the waves were rough and so blue-green. Oh, it was like paradise! Evidently people can camp on the island, so I think we may go back and camp sometime (in spring or fall, because it could get VERY hot in the summer). It was such a relaxing and fun adventure. I can’t wait to adventure more with my husband. He is a joy!